This bread started out as a query, as me wondering, “What if...?” I had been planning and baking for my breads party/photoshoot for several days, and my mind was locked in bread mode. I was thinking, living, breathing nothing but breads. I wondered, “What would happen if I used some chicken broth instead of water in a bread?” I started to ponder that thought for a while, then I went to that font of all knowledge and wisdom, the Internet. Sadly, what I had originally believed was a fresh and unique idea was, in fact, pretty common. I found a number of descriptions and recipes. In the end, I went back through my own recipes and decided just to try to substitute it part for part. But then, I thought about it, and realized that there would be salt in the broth, and some oil as well, so I lessened or eliminated those ingredients. I wasn’t sure if the broth would be too heavy or too damp. But I thought I’d give it a try! Once it was ready, I mixed in the sugar and the yeast. I set that aside for another ten minutes or so, and let it foam up. I was a bit concerned about any salt in the broth reacting with the yeast, but it turned out OK.
Then I sifted in the flour and added the table salt. Remember that I usually start with a little less flour. I stirred it all up, then dumped it out onto the liberally floured countertop. From here on out, I treated it pretty much like any other bread. I kneaded until it developed a good gluten windowpane, then stretched the surface into a tight ball, and set it aside to rise. It rose for an hour or two, getting doubled, and then I lit up some coals. While those were turning white, I kneaded just a little more (two or three pushes, at the most) and restretched and reshaped it into a boule (ball) again. I put this into the proofing basket. Soon, the coals were all lit, and so I oiled the inside of the dutch oven, and set it out on the proper amount of coals, both below and above. I let that preheat for an additional 15 minutes, then I brought out the bread. I tipped it into the Dutch oven, then sliced the top. Unfortunately, my knife wasn’t very sharp (always use razor blades) so it ended up tearing more than slashing. Quickly, I put the lid on and marked the time. After 15-20 minutes, I knocked the ash off the coals, rotated the Dutch oven and the lid, and lifted the lid to check on the progress, and to insert the thermometer. After another 10-15 minutes, I checked, and it was past 200°, ready to come in. After cooling on a rack, I was able to cut into it and taste it. I was pleasantly surprised. The chicken flavor was there, but not prominent. Very subtle. 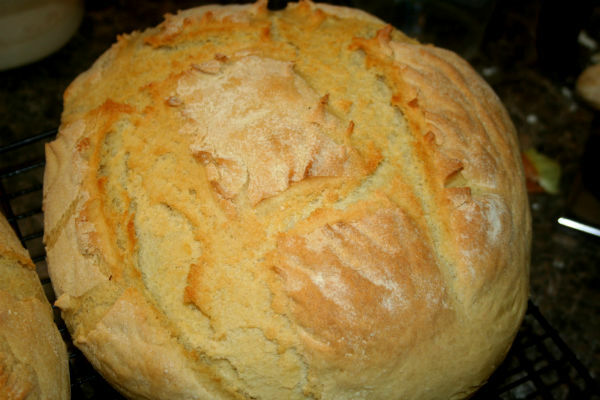 It tasted great as a sandwich bread, and then, later, at the bread party, in the cheese fondue dip!